Case Study 2 - Noise Reduction in 1890’s Victorian Property. The following customer lived in an 1890’s property with traditional timber sash windows. The house was located on a very busy high street with large volumes of traffic and people walking past until the early hours. Also the rear of the house backed onto a busy Public house that featured regular live music at the weekends. The rear of the house was where the baby’s room was located and was regularly woken by loud music and late night revellers. We were contacted via the website to see if we could install specialised glazing into the existing sash windows and renovate them as the customer was very keen to keep all the properties period features. The customer was surveyed and given a detailed quotation for a special sound proofing glass and a full renovation including new sills and other repair work. We were asked to undertake the work as our quotation covered all the aspects of the customers brief and our timescale suited the customer’s plans. 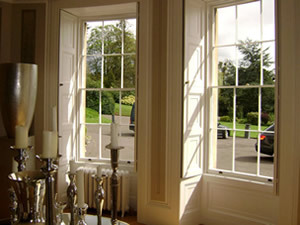 The sash windows were in poor condition and required a full renovation and draught proof and a complete decoration. The sills were completely decayed. The windows were inoperable due to excessive painting and some windows were painted partially open. All the windows were draughty and rattling. The sheer volume of noise with the existing single glazing had kept the customers awake and their baby was regularly disturbed. The whole process and stages were captured on camera to show the full process of repair service we offered. As we are the only Sash repair company to offer a full in house decorating service, the windows were repaired and painted and commissioned as a one stop service. We offer the unique service of painting the entire box whilst the sashes are out. This ensures all the sash window is protected against future weathering. The sashes were removed and all the repairs undertaken on site by our skilled joiners. This included construction joint repairs, glazing bar repairs and various bottom rail repairs. The entire single glazing was removed and all the existing putty. The sashes were machined on site to accept the new slim line double glazing. We installed a 14mm unit with Stadip Silence glass. This glass is unique to reduce noise on main road dwellings. The glass has a unique characteristic of deflecting sound with a clear film manufactured into the glass. The units were bedded onto a glazing compound and finished with traditional putty. The unit’s spacer bars were behind the glazing bars and had white spacers. It was virtually impossible to see the windows were double glazed. The windows after the repairs were completed were preserved, primed and undercoated. The sills were replaced with Iroko and given the same treatment. 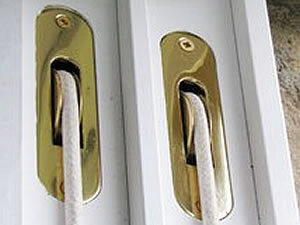 The sashes were installed with new cords and then draught proofed with a unique Teflon draught proofing to eliminate draughts and rattles. Once the sashes were rebalanced with new heavier lead weights, new locks and lifts were fitted. The final two top coats were applied to the finished window and all the glass cleaned. The windows were commissioned and the photographs on Case Study 2 Gallery shows all the stages. Photographs labelled before, during and after. The customer was thrilled with the final outcome and had these words to say. Since this work was completed we have been asked to provide a quotation for more windows at the property. "I am very happy with the work carried out by R&R on my property. My windows (which are well over 100 years old) look like new and the restoration carried out have meant that we now have a much quieter, smarter and hopefully come winter, warmer home. Mark & his team worked at my home with consideration to my family and requirements and I was kept fully informed at all times of all work carried out. I would certainly recommend them".